I can't tell you how many times I sang this song while planning my niece's first birthday party. The first time I broke out into a passionate rendition of Part of Your World, my family was amused. The second time perhaps they were a bit annoyed. I'm guessing by the fourth time they were slightly concerned for my mental health. What can I say? My love of The Little Mermaid runs deep. It probably has something to do with the fact that I was 6 when the movie released and every song is etched permanently in my brain. This party was fun for so many reasons, not the least of which was that I have had way too much pent up 'girl party' energy. 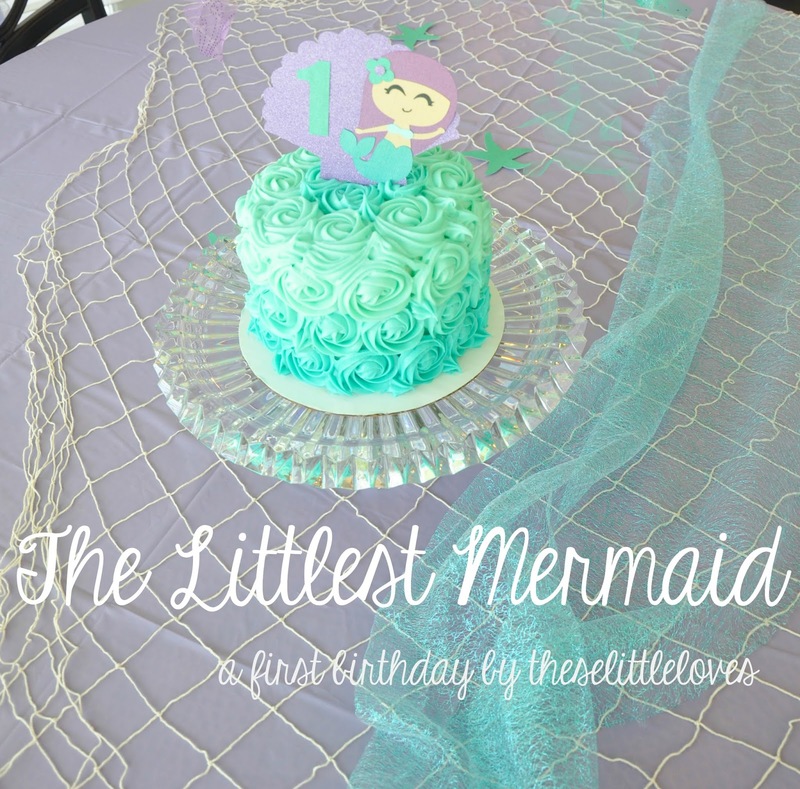 This was the first birthday party for my niece! I now have two nieces, but until now the birthdays have been all boy...tools, nemo, planes, cars. I practically begged my sister-in-law to let me throw this party. 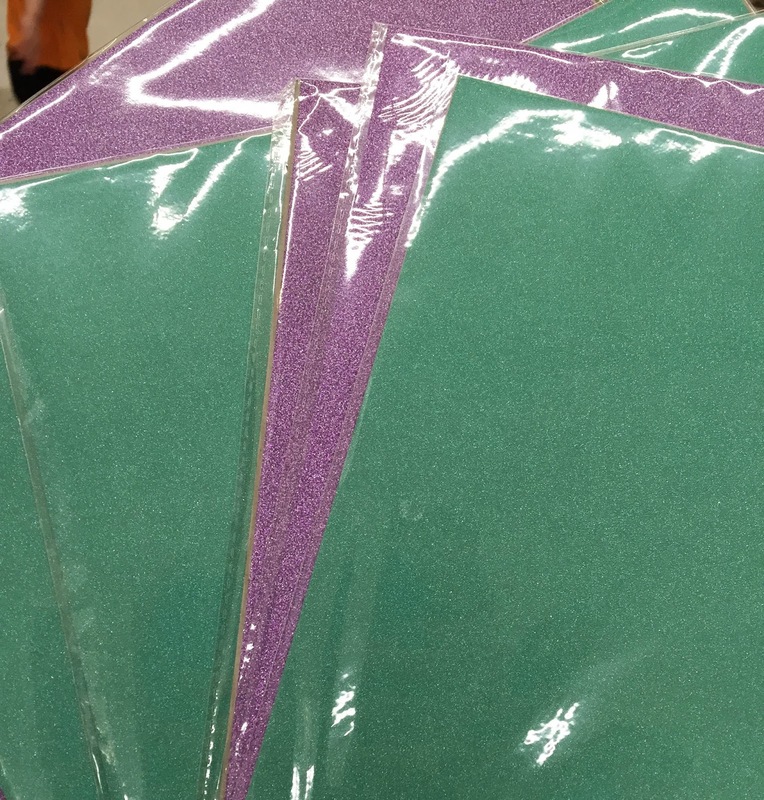 She agreed and I promptly bought out the fabric store of sparkly teal and purple tulle. I must have been asked about 5 times what I was making while walking through the fabric store. 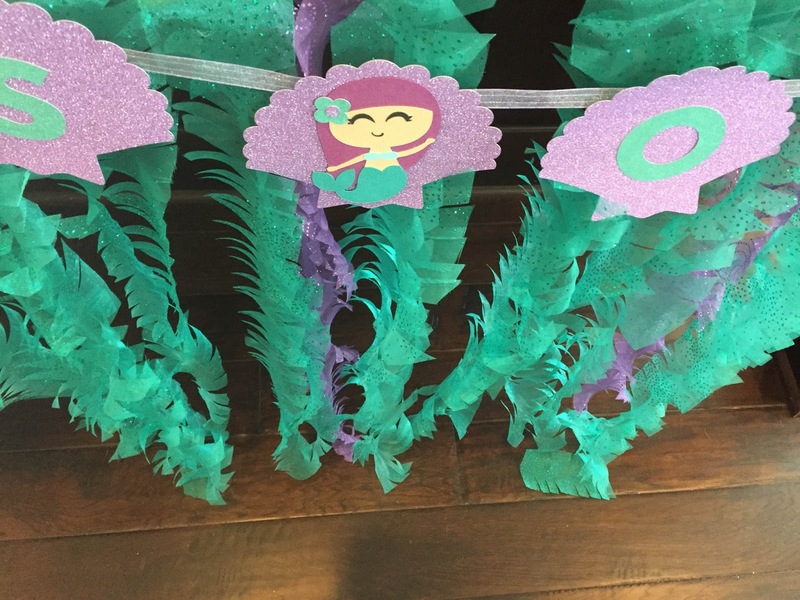 The decorations all started with the idea to make seaweed. Very girly, pretty seaweed. 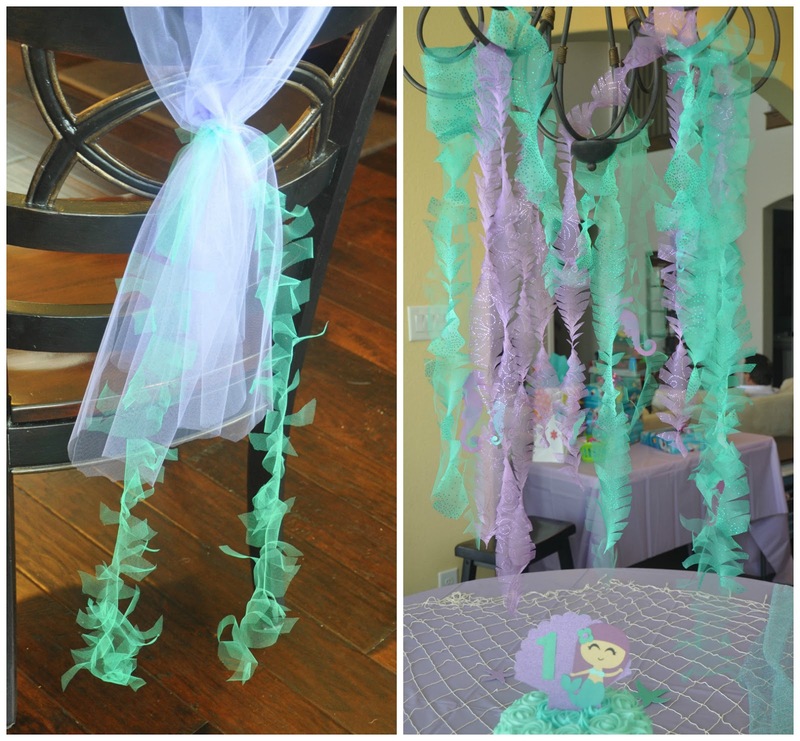 We hung seaweed from tables, chairs, the front door, the gift table, even the chandelier. 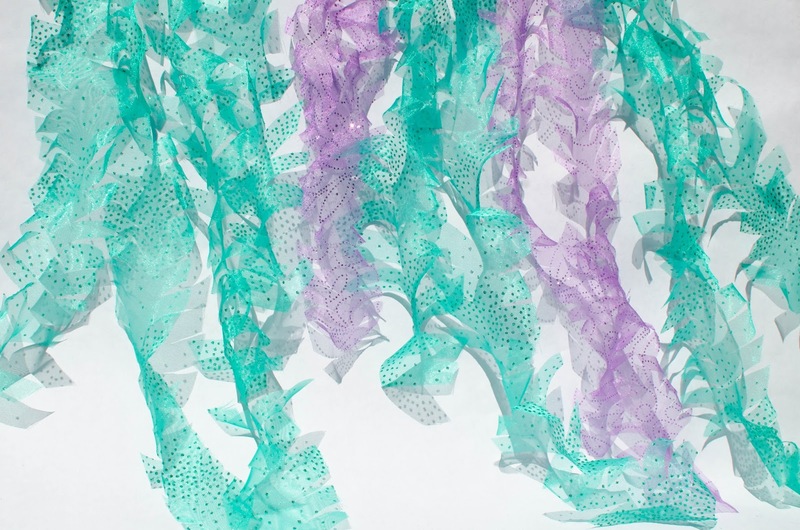 The tulle naturally twisted when cut into the seaweed strips and gave it the perfect look. 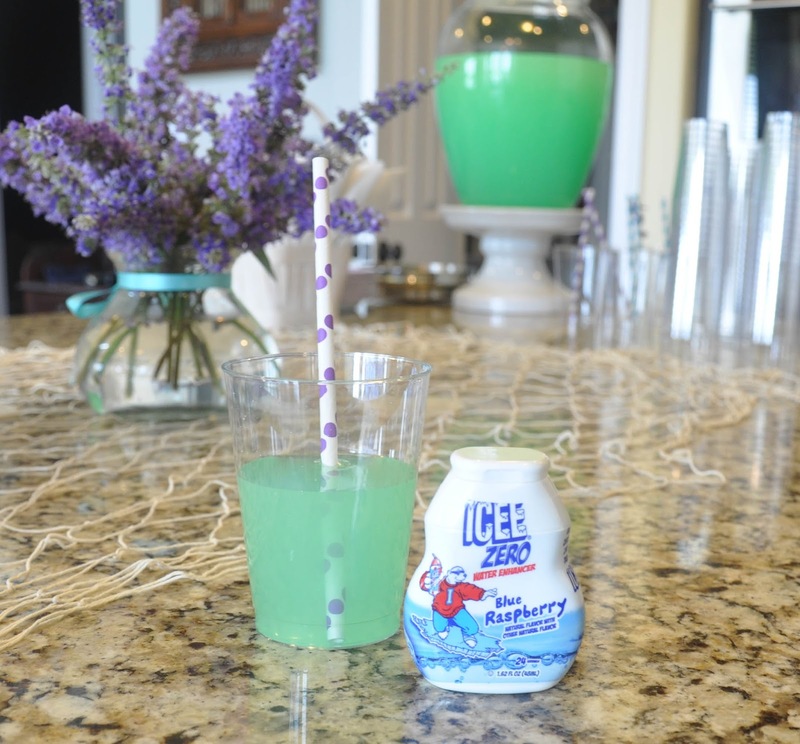 Check out my DIY seaweed blog post for detailed instructions on how to make your own! 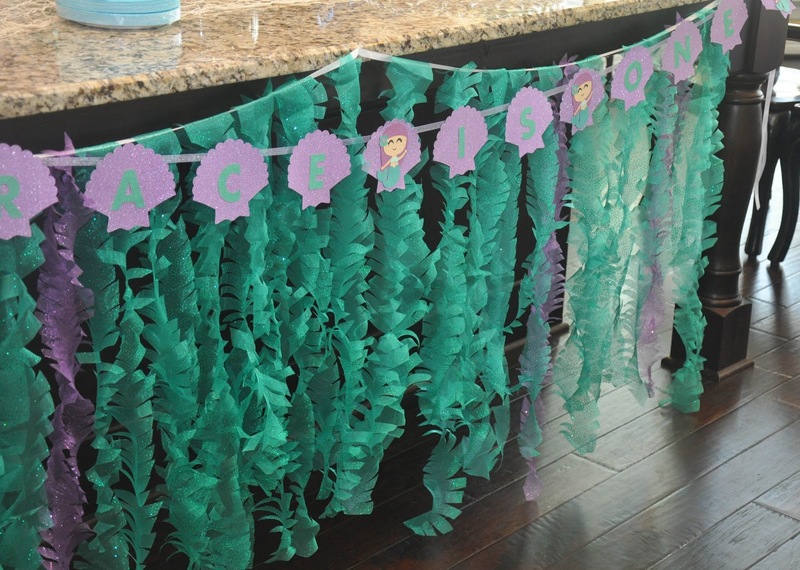 The seaweed made a great backdrop for the party garland. Big impact for a cheap price. A few seahorses even found their way into the seaweed for effect. 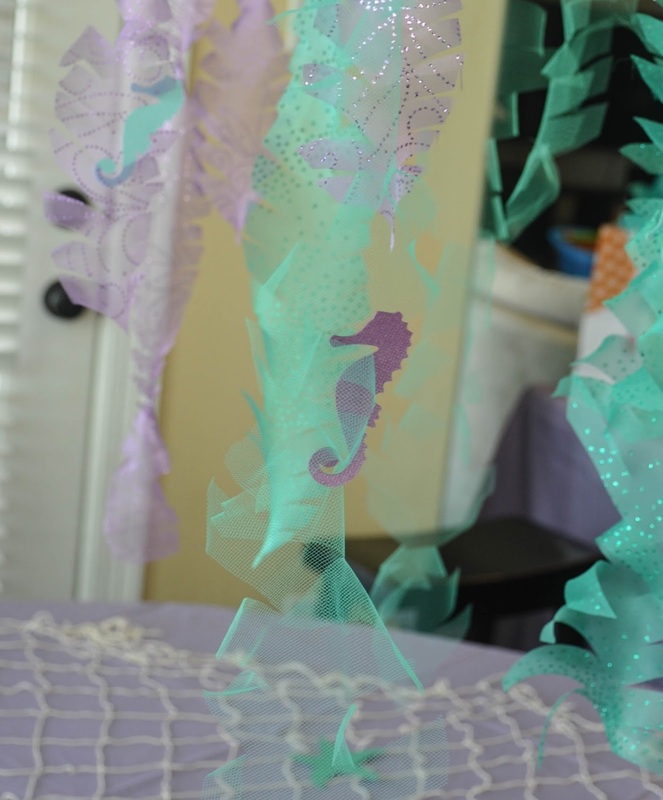 Instead of going full 'under the sea' I kept the decorations to the prettier of the sea creatures: mermaids, seahorses, starfish, and clam shells. Everything was purple, teal and white and almost everything had a shimmer or a sparkle. Even the utensil packets were held together with sparkly green washi tape. Like I said, pent up girlyness. My Silhouette Cameo cut the glitter paper (the kind individually wrapped in a plastic sleeve that doesn't shed glitter) like a dream. 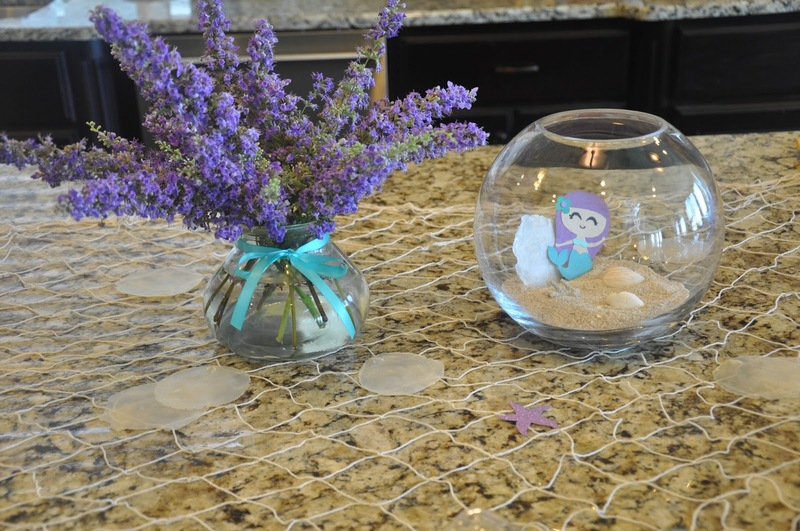 Purple floral cuttings from my mom's tree, a party store net, a fish bowl sand scene, and some capiz shells finished off the look. As an afternoon party, we kept the food simple with croissant sandwiches, chips and dip, and fruit salad. 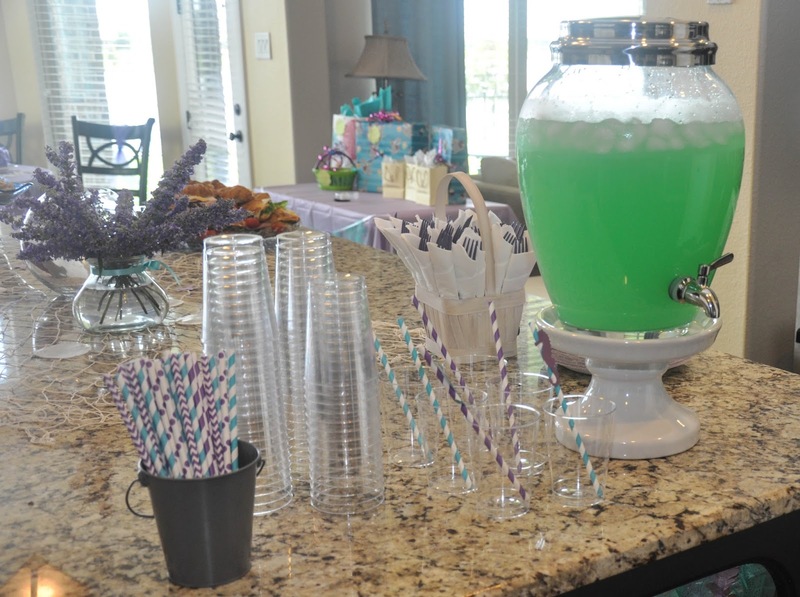 Fitting with the color scheme of the party we turned lemonade teal by using blue raspberry water enhancer drops. The desserts, as always, were my favorite. 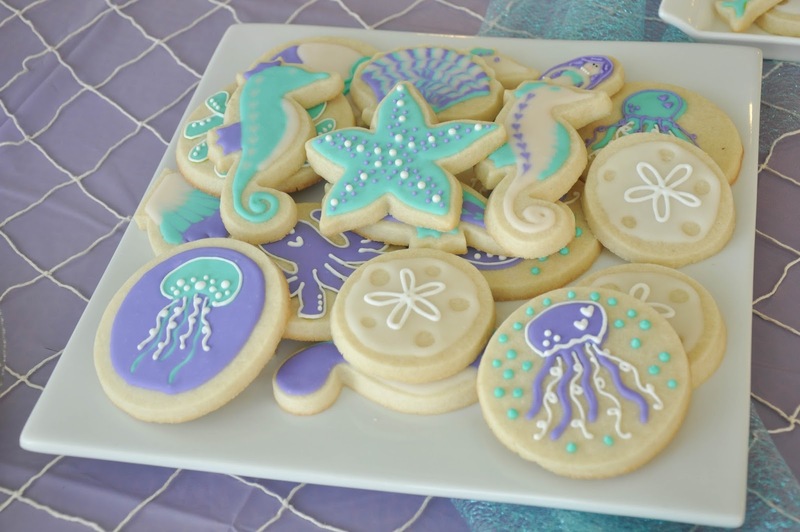 All the cookies were decorated with a glaze icing with a royal/buttercream icing for the detailing. 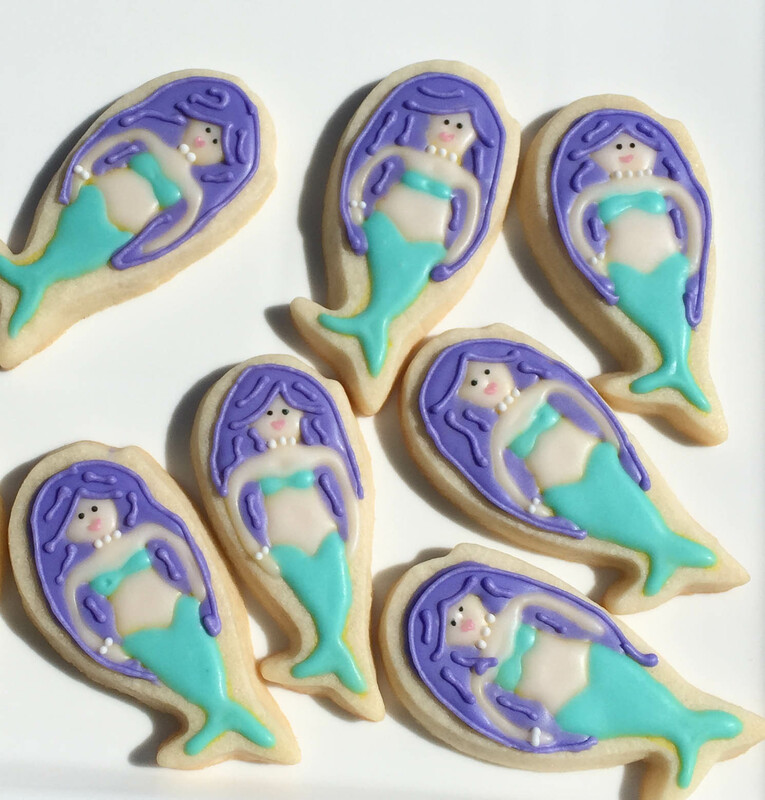 Inspired by sweet sugar belle's use of a whale cutter turned into a mermaid, I attempted my own version. I couldn't believe how well they turned out! 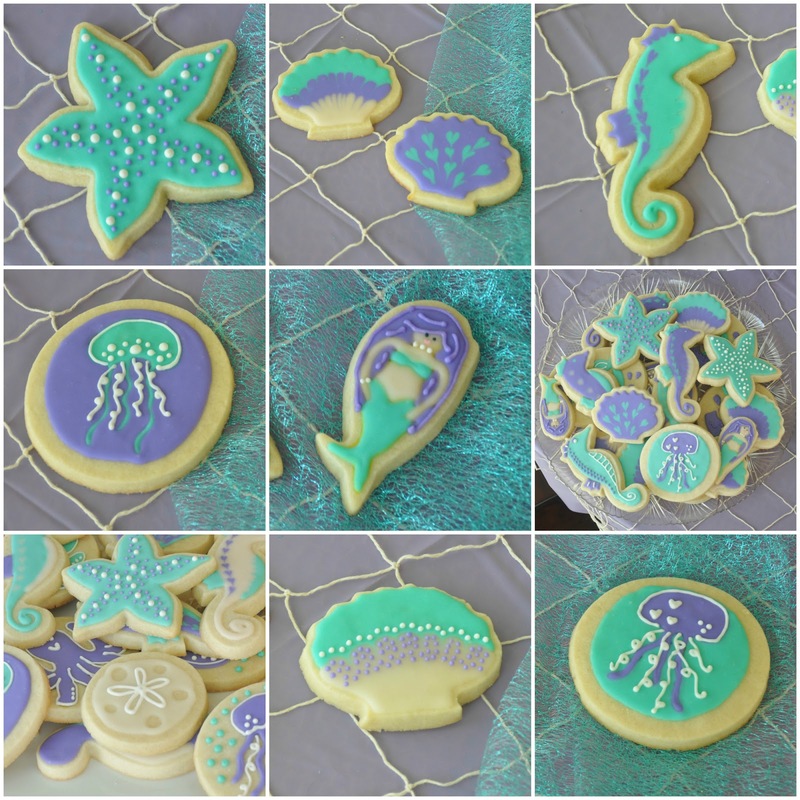 Using a food coloring pen to draw a guideline on the cookie before decorating is genius and a huge help for an elaborate cookie. I clearly had way too much fun with this cookie theme. 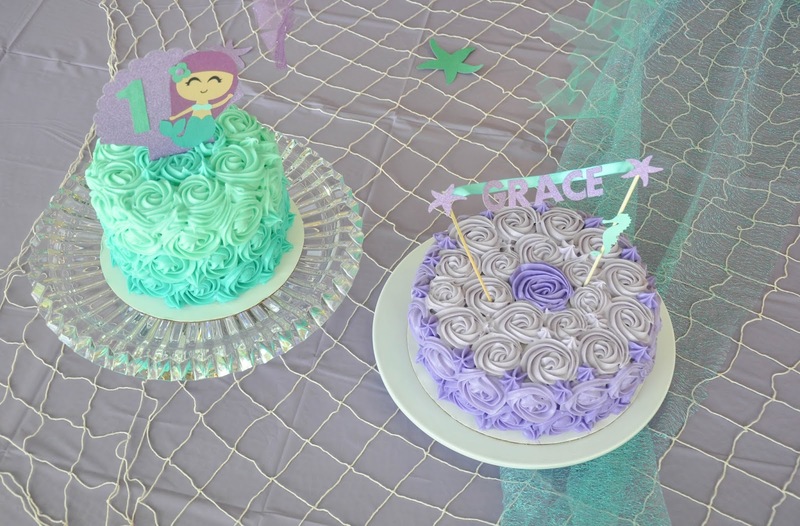 My SIL requested two cakes, a smash cake for the birthday girl and a larger cake for cutting and serving to guests. 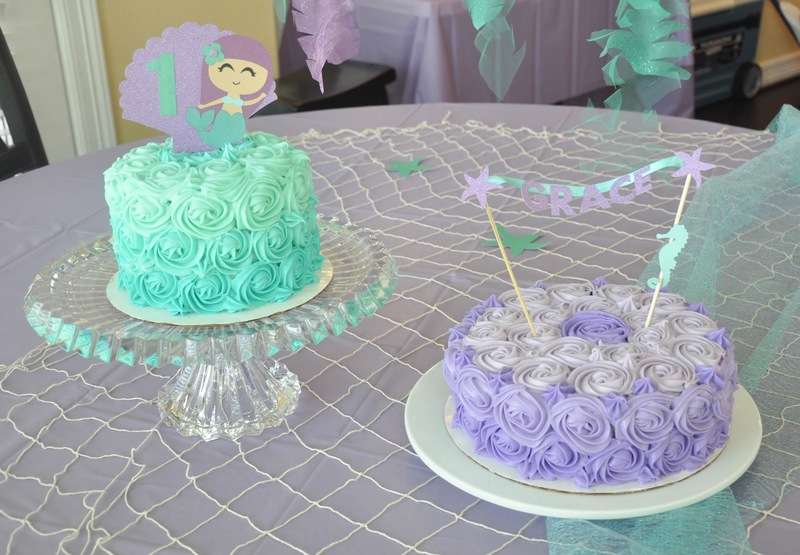 With two cakes, you need two cake toppers, which we of course DIY'ed using bamboo skewers, glitter paper, ribbon, and a glue gun. 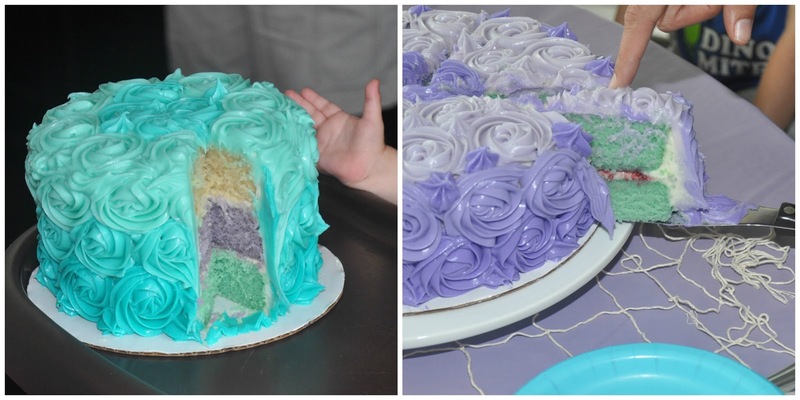 Ombre rosettes covered each cake, one in purple and one in teal. I highly recommend this white velvet cake, with a cream cheese frosting, and raspberry preserve filling. Delicious! And easily color-able if you want a little surprise for guests when cutting the cake. 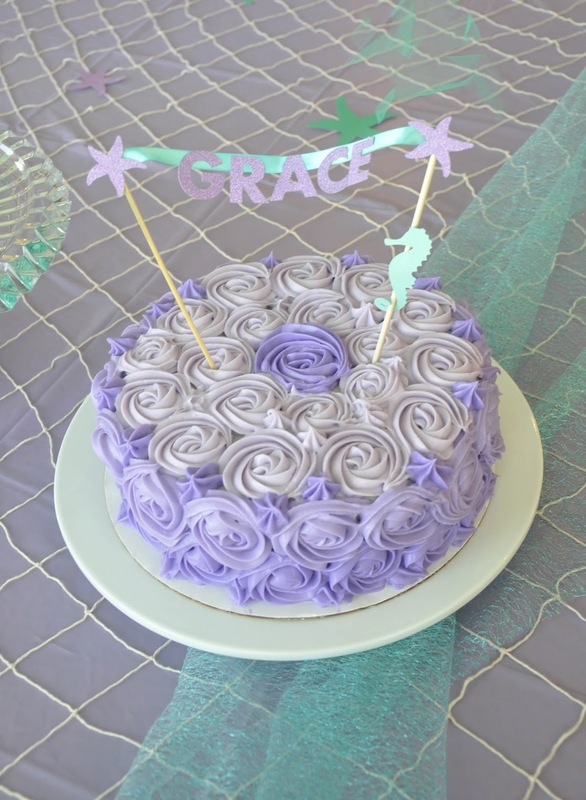 Our darling Grace was the star of the show and it was a blast spoiling her on her big day. 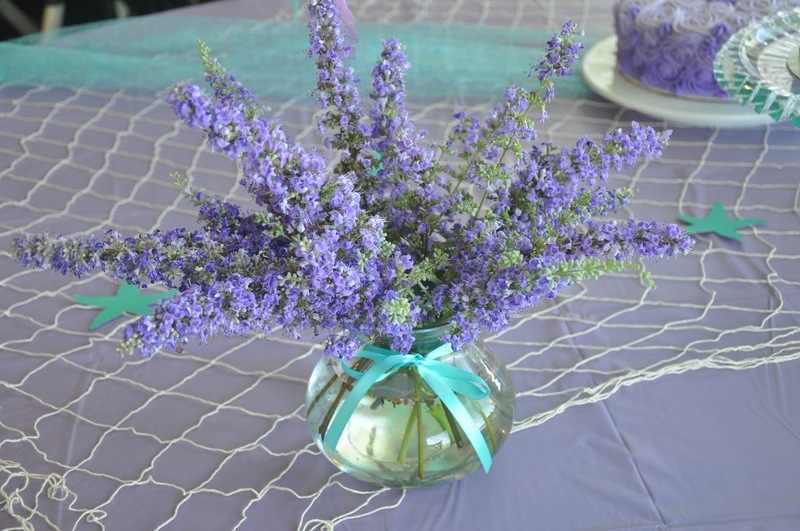 Like these decorations, but not enough time to DIY? Check out my etsy listing here while it lasts! 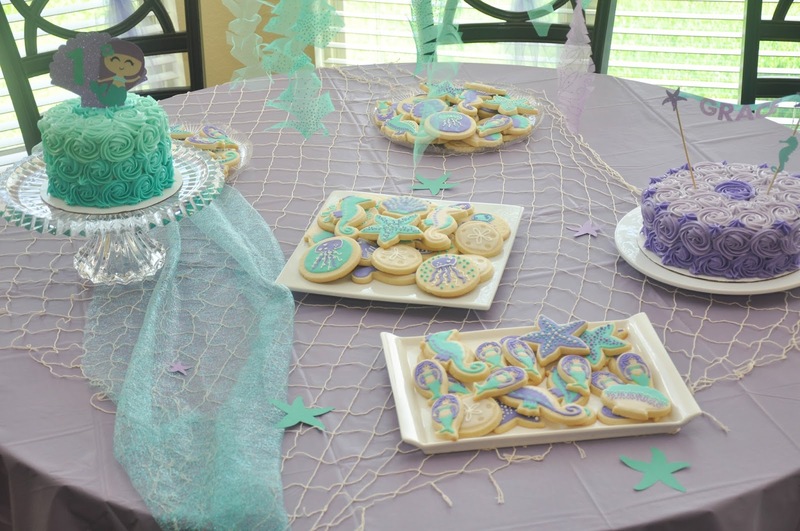 Looking for more mermaid party inspiration? 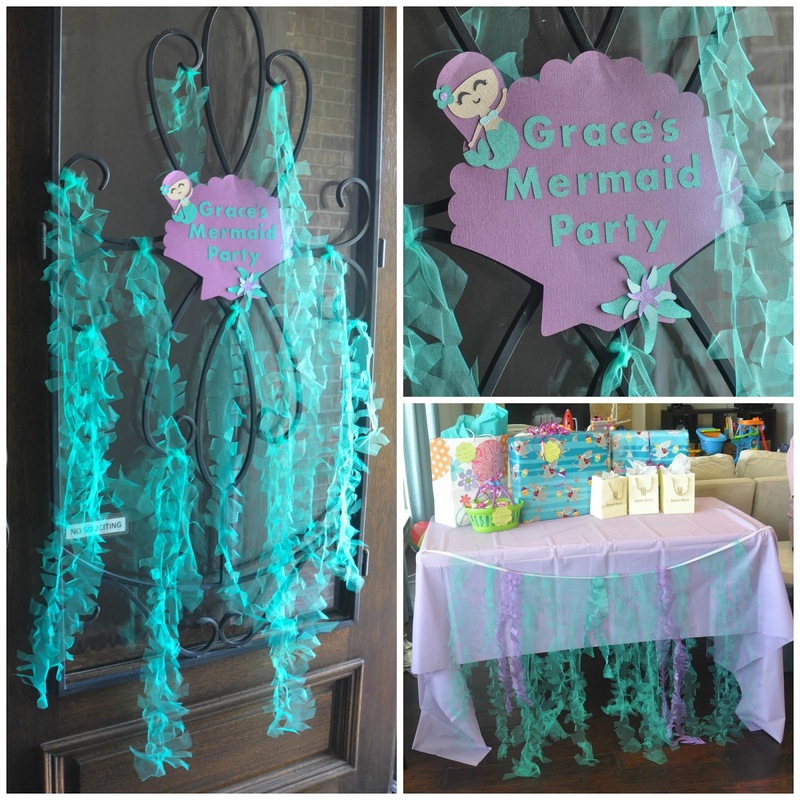 Check out my mermaid party pinterest board here. This is not a sponsored post and all supplies were purchased by me or my family.